MYSTERIEUSEMENT LES MEILLEURS PRISES DE SON DE LA DECENIE SUIVANT. 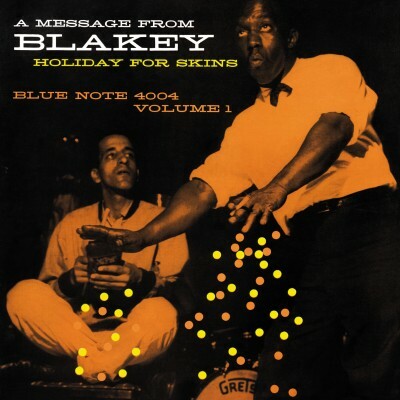 This is Art Blakey’s most rare project dedicated to percussion and probabaly the best one. Art Blakey is here leading a great jazz and percussionist large band. Art Taylor and Philly Joe Jones on drums, Donald Byrd on trumpet, Ray Brant on the piano, on percussions not less than Ray Barreto, Sabu Martinez, Victor Gonzales, Julio Martinez, Chonguito Vicenten, Fred Pagani Jr and additionally a great choir. The result is a rich confrontation of african and latin rythms with contemporary jazz of these late fifties. “The Feats”, “Agnaho” & “Lamento Africano” represent the peak of this recording session, counterpoints, breathtaking variations in rythm and tempo and a real liberty of expression for each soloist. Classic jazz is not absent and is illustrated here by tracks such as “Otinde”, or the Ray Bryant compositions : “Swinging Kilts” and “Reflection”. The whole record is a vibrant celebration of pure rythm, let us no forget that Art Blakey has travelled extensively until Africa and was deeply aware what Jazz was owing to african and latin patterns. The sound of the record is unbelievable for this date of 1958.